Small, sassy and definitely not what you would call sedentary. 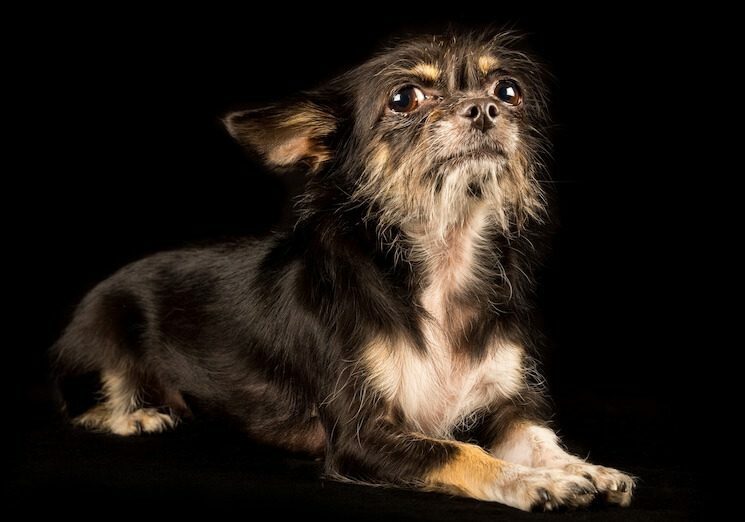 A Chorkie is the proud and powerful result of a Chihuahua and a Yorkshire Terrier. A Chorkie Dog may only be 6 to 9 inches, but, do not let their tiny demeanour fool you. Once you meet a Yorkie Chihuahua Mix, you will understand just how confident they really are. Perhaps the perfect side kick if you’re looking for a portable, sassy and outgoing little pooch? Welcome to the perfect guide to help you decide if the adorable Gremlin-like dog is a must-have designer mix. A Chorkie is a designer dog breed with a confident personality and lively temperament. When a bold and intelligent Yorkshire Terrier is on heat and mates with an out-going and sassy Chihuahua, the result is your Chorkie. A diva-like, outgoing yet intelligent and loving designer dog breed. It doesn’t matter which parent breed is the mother or the father, as long as you have two purebred parents. Free Owners Guide: Get a free copy of our Chorkie owners guide to learn more about this designer mix breed. 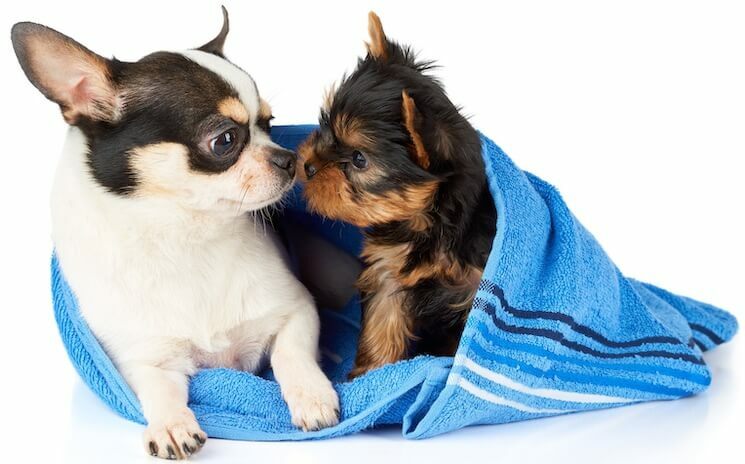 In the past 12 months, this breed has become increasing popular globally due to their portable size and lively personality, with some special pooches having their own instagram accounts. 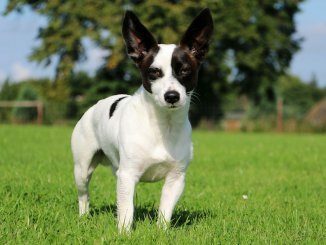 As this breed is designer mix, and not a purebred dog, they are not recognized by the American Kennel Club, which may result in finding the perfect breeder rather hard. Typically, they are born into a litter of three to five puppies. Each puppy is an individual and there is just no telling which parent breed will dominate; like any designer mix. The cost of a Chorkie Puppy is dependent on the quality of their purebred parents. But on average, they range from $400 to $600 USD. It was during the 1990s when this small and sassy designer mix first originated. Two decades ago, in the 1990s, small breeds were gaining popularity throughout America and Europe due to their ease of care. Chihuahuas were especially popular to breed from during that era (e.g. other Chihuahua mixes). 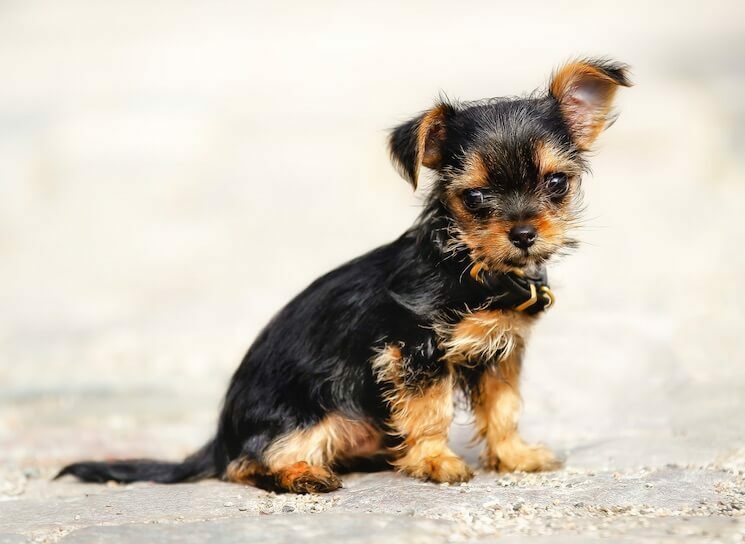 The parent breed, the Yorkshire Terrier, originated in England and is now voted as one of the most popular small dog breeds in the United States. 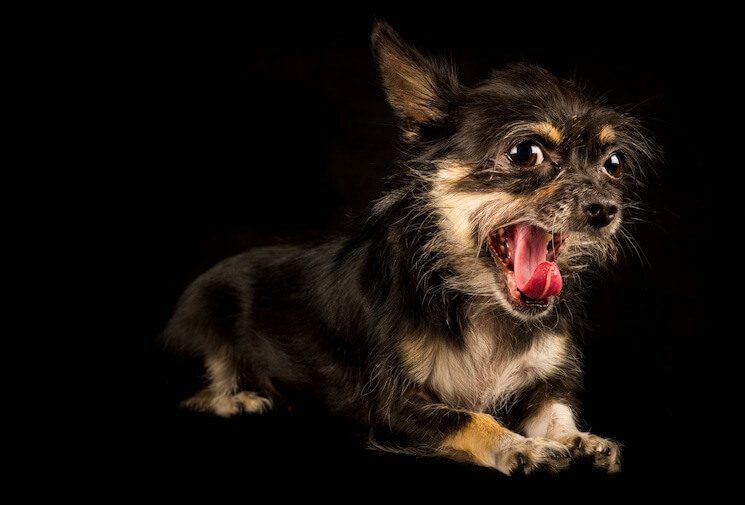 Coming in hot at number six is the bossy, fearless and cute parent breed, the Chihuahua, who carries Mexican roots. These two parent breeds may originate from very different backgrounds but when mixed, they produce a feisty and loveable Chorkie. A tiny gremlin who is sure to win over your heart. A Chorkie has a lifespan of approximately 10 to 15 years. However, every pups health is different and therefore this may differ. This dog is small and is not expected to grow big and strong, although their personality may tell you otherwise. An adult Chorkie will weigh anywhere around 8 to 15 pounds, and reach a maximum height of around 6 to 9 inches. So the question really isn’t “how big does this breed get” but more so “how small does this breed stay”… Well, they are perfect for your pocket or bag. The cost can range from $400 USD to $600 USD based upon their age, parents, size and temperament. If you are interested in a timid and sit-on-your-lap-all-day type of dog. Then move aside. A Chorkie is a breed well suited for an out-going, feisty loving, bubbly soul. Don’t get us wrong, these pups are huge cuddlers, but they are not so timid. Designed for someone who loves enthusiasm and confidence, but, also would love the ease of carrying around a small dog. A Chorkie is super friendly although they may be protective due to their Yorkshire Terrier heritage. They are very loyal to their owners and will always have your back, even if they can’t reach it. If trained properly, then they can get along well with children; but it’s not recommended. He will love to play. However, due to his sass, he may become annoyed easily. If your small child does something that they don’t like, then he will let them know about it. Therefore, like with any animal, it may be best to keep an eye on your dog and child together. Yes, they are known to be barkers. So make sure you actively keep them entertained when possible. They are small but active little things. They are a trainable breed but they can be a little bossy. So they may require a more patient owner. As this is a toy dog breed it isn’t hard to meet their exercise needs. But they do require a lot of mental stimulation and training, as they are known to be unnecessarily talkative. A Chorkie Dog is not a difficult breed to care for. Especially with their small size. Usually caring for them will be quick and simple; it’s really only their personality which needs to be attended to. Feeding a Chihuahua Yorkie Mix is cheaper than feeding a child. They are tiny as a puppy and stay small as they mature; there is only so much they can fit into their little bellies. So don’t worry about the cost of feeding your pup as they won’t eat away at your wallet. How much does a Chorkie eat? Approximately ¼ to ½ of high quality dry kibbled dog food per day based on their weight. Try specialized toy dog breed kibbled food, these are specifically formulated to ensure your puppy’s nutritional needs are met by containing the right amount of protein, fats, carbs, vitamins and minerals. 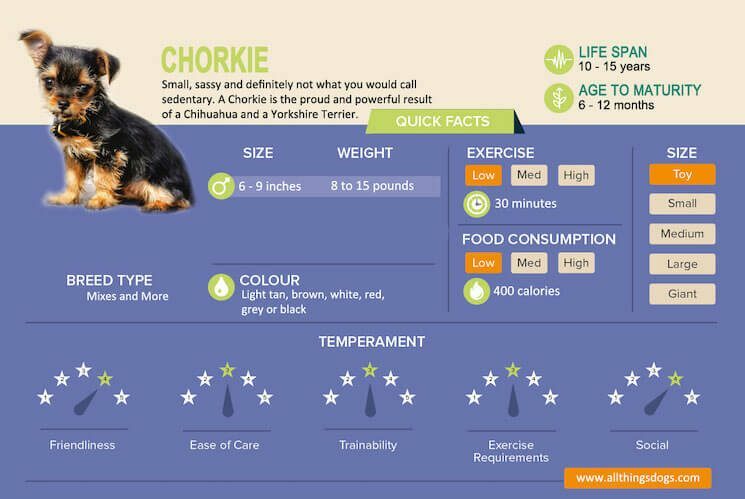 On average, your active and fully grown Chorkie will require around 400 calories per day; that’s just 20% of a fully grown woman’s requirements. Their calorie intake may vary depending on their age, size and activity level. Just remember to keep feedings measured and consistent as small dogs may be prone to unwanted weight gain. Don’t forget to still give them a tasty treat or two. Exercising a dog is more than just a few short walks. A nice brisk evening walk won’t hurt however, and will do wonders, not only for you, but also your pooch. As a toy dog breed, they will be able to meet their daily exercise requirements simply by running around the house, playing a few games with a little one-on-one after work and a short walk daily. Try a half an hour walk around the block, at the dog park, or just down to the shops. Just because they can fit in your purse, doesn’t mean they should always be kept there. Playtime also provides mental stimulation mixed with bonding time whilst exercising your pooch. Try games which will stimulate your Chorkies mind and exercise their body. Fetch is a perfect game to play with your Chorkie as it will also give them the exercise they need. If you didn’t already know, fetch is easy. Fetch really is that simple, and if you see that little tail wag, then you will know you are doing the right thing. Mental stimulation can also be provided through changes in your pup’s visual cues. Try switch up your evening walks. Surprise your dog and take different routes from time to time. Or, why not take them on a little day out to the beach? Perfect during those warmer months. The word “Sassy” cannot be used enough in this article. This breed may be a little stubborn and bossy, which may make training a little more difficult. But this doesn’t mean they don’t have a brain; quite the opposite – they are actually quite an intelligent breed. Just remember to be patient and understanding, try not to get frustrated. Your Chorkie probably feels the same way when they try and train you. Just be positive and mix training sessions up with positive reinforcement; as it has been proven to be the best training method. You could try different rewards such as treats, or toys. Oh, and don’t forget to give them a tiny high five and rub that belly. They love praise and it will encourage them to repeat positive behaviors. House training is usually an issue that may be faced with this breed. So try focus a little more carefully on this area and remember, accidents happen. Try to keep a focused training plan starting with basic commands and behaviors. Your Chorkie will be very outgoing and therefore socialization is important. Sometimes they need to be brought down to earth a little bit and be reminded that they are not the only animal on this planet. Begin socialization from a young age; ideally as soon as you get your pup. In fact, the younger the better. You want your dog to accept other animals and humans. It is important that you introduce your dog to a range of animals and people, this includes children too. Try socializing through puppy classes, dog parks, casual introductions (to friends or pets), or just on your regular evening walk. Why not pop into a friend’s place and show off your little sass queen/king? A bored pup may be a destructive pup. Boredom in a dog may lead to all sorts of negative habits which can easily be avoided with a little extra attention when possible. Socialization, not only improves your pup’s etiquette, but it also provides them with mental stimulation. Your designer mix may be prone to skin problems such as rashes and other allergic reactions. 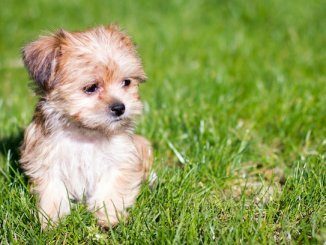 Atopic dermatitis is an example of an allergy related skin reaction which your Chorkie may develop due to genetic conditions or environmental conditions. This is the dislocation of your pup’s knee cap. If left untreated this may become quite severe and your pup may need surgery. Symptoms to look out for include lameness, and the holding of their leg up in the air for prolonged periods of the time. If in doubt, just call your local Veterinarian. Better safe than sorry. Your Chorkie is a petite little thing; classed as a Toy Breed. They have a rectangular shaped body. They usually have short legs to match their small body. They weigh 8 to 15 lbs and only reach a maximum height of 6 to 9 inches. Their coats are usually medium in length, and are quite fluffy. Their coat is quite light and doesn’t shed much so don’t worry about finding those tiny hairs all over your freshly vacuumed carpet. They are known to get rather oily (but nothing a quick bath can’t fix). Their fur may come in a range of colors: from light tan, to brown, grey, white, and even red. A Chorkies fur may even have markings of different color. They have little semi-pointed ears which reside on the top of their small head. They also have a tiny button black nose, with large dark eyes; similar to other Terrier cross breeds. Regular brushing is required, this helps to minimise risks of matting and tangles. 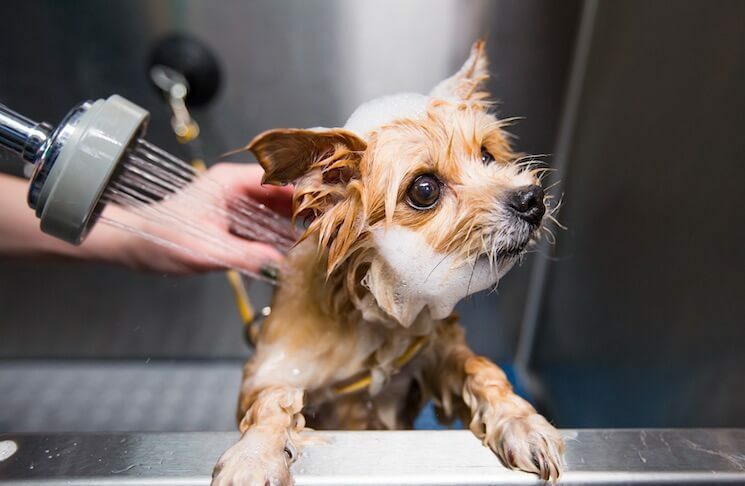 Bathing your dog once per month should be enough. But if they happen to get dirty on a day out, then yes bath them when necessary or you may see tiny, tiny, tiny little mud trails down the hall way. One important grooming requirement that Chorkies have is ear trimming. No, not docking their ears. But, cutting the hairs in their ears. Excess ear hair growth may make your pooch susceptible to ear infections as unwanted bacteria may get trapped in the ear canal. Just keep the hair in their ears trimmed and you should be okay. Nail clipping and teeth care is essential for any breed. Nail clipping, and teeth care are also essential. This is the same for any breed. Keep those nails at a reasonable length so they do not become ingrown and painful. You can buy doggy dental supplies from your local Veterinarian or pet store. If your dog just won’t put up with teeth brushing, then opt for dental treats. Short, sassy, fun and loveable. So you think a Chorkie may be the right designer mix for you? Well, if you are looking for a portable yet active sidekick then find a reputable breeder or rescue center. If you’re still not sure, take a look at their sibling the Shorkie. 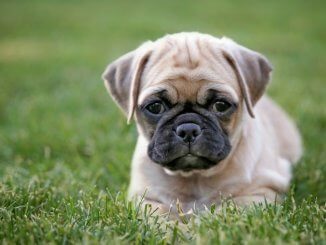 With the correct training, socialization and of course, attention, they can make the perfect bubbly addition to your family. Prepare for a whole lot of attitude in the most compact package possible. Have you seen a more beautiful gremlin? Comment your thoughts below.